Edited and introduced by Hans-Helmuth Gander. Frankfurt a. M., Klostermann 1991. (This volume gathers talks given in Meßkirch, 23 – 26 September 1989 at the fourth conference of the Martin Heidegger Society in honour of Heidegger’s centenary). Edited and introduced by Hans-Helmuth Gander. Frankfurt a.M., Klostermann 1993. (Collection of talks held at the sixth conference of the Martin Heidegger Society, 5 – 6 October 1991 in Meßkirch. Heidegger’s talk “Europe and German Philosophy” held in 1936 in Rome is also included in the volume). Edited and introduced by Hans-Helmuth Gander. Frankfurt a. M., Klostermann 1994. (Talks held at the seventh conference of the Martin Heidegger Society, 1 – 3 October in Meßkirch). Edited and introduced by Ewald Richter. Frankfurt a. M., Klostermann 1997. (Talks held at the eighth conference of the Martin Heidegger Society, 25 – 27 May 1996 in Meßkirch on the occasion of the twentieth anniversary of Heidegger’s death). 5 “But Origin always comes to meet Us from the Future.” Martin Heidegger and the Question of God. Edited and introduced by Paola Ludovica-Coriando. Frankfurt a. M., Klostermann 1998. (Talks held at the ninth conference of the Martin Heidegger Society, 10 – 12 October 1997 in Meßkirch). Edited and introduced by Peter Trawny. Frankfurt a. M., Klostermann 2000. (Talks held at the tenth conference of the Martin Heidegger Society, 1 – 3 October 1999 in Meßkirch). 7 Dimensions of the Hermeneutical: Heidegger and Gadamer. Edited and introduced by Günter Figal and Hans-Helmuth Gander. Frankfurt a. M., Klostermann 2005. (Talks held at the twelfth conference of the Martin Heidegger Society, 10 – 12 October 2003 in Meßkirch). 8 Heidegger and the Greeks. Edited and introduced by Michael Steinmann. Frankfurt a. M., Klostermann 2007. (Talks held at the thirteenth conference of the Martin Heidegger Society, 13 – 16 October 2005 in Freiburg). Heidegger Forum 2 Heidegger and Husserl: New Perspectives. Edited and introduced by Günter Figal. Frankfurt a. M., Klostermann 2009. (Talks held at the fourteenth conference of the Martin Heidegger Society, 12 – 14 October 2007 in Freiburg). Edited by Günter Figal and Ulrich Raulff. Frankfurt a.M., Klostermann 2012. 11 Interpretations: From Parmenides to the Black Notebooks. Edited by Harald Seubert und Klaus Neugebauer, Alber Verlag, Freiburg i.Br. 2017. (Talks held at the conference of the Martin Heidegger Society, 06 – 08 May 2016 in Vienna). 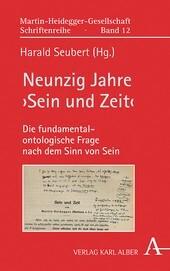 Edited by Harald Seubert, Alber Verlag, Freiburg i.Br. 2019. Edited and introduced by Harald Seubert. (Collegium Hermeneuticum 7). Köln/Weimar/Wien: Böhlau Verlag 2003.